A JPL-built Open Source Rover example, showing off the Rocker-Bogie suspension as it rolls over a pile of rocks. Have you ever wondered what it takes to build a rover like NASA’s Curiosity rover, part of the Mars Science Laboratory project? One would rightfully assume it takes expertise in mechanical engineering, software development, and electronics to even begin to construct such a complex robot. 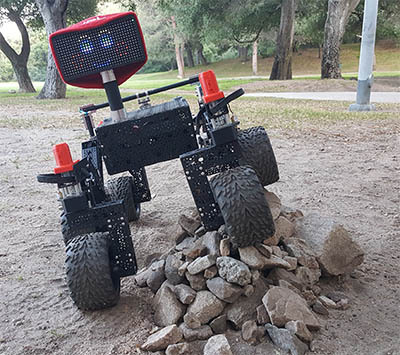 Now students, hobbyists, and enthusiasts can learn about these skills and get a taste of what it is like to construct such a rover using plans and instructions from JPL’s Open Source Rover Project. 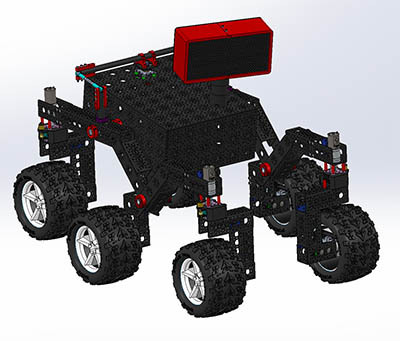 CAD drawing of the baseline Open Source Rover, as available through GitHub. 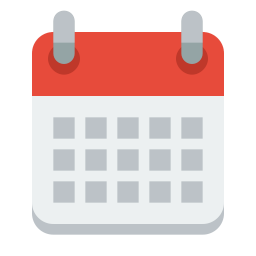 With an active builder/developer community, there are a number of directions development could take. It is possible technology developed by builders could be used in some way on future missions on Earth and in space, or universities and companies might one day launch their own. “We released this rover as a base model,” says Cox. “We hope to see the community contribute improvements and additions, and we’re really excited to see what the community will add to it.” The JPL OSR developers are also looking forward to seeing a fleet of these rovers pop up in schools and workshops everywhere.